Elegant off-screen controls for iTunes. Is there a better alternative to Cockatoo? Is Cockatoo really the best app in Music category? 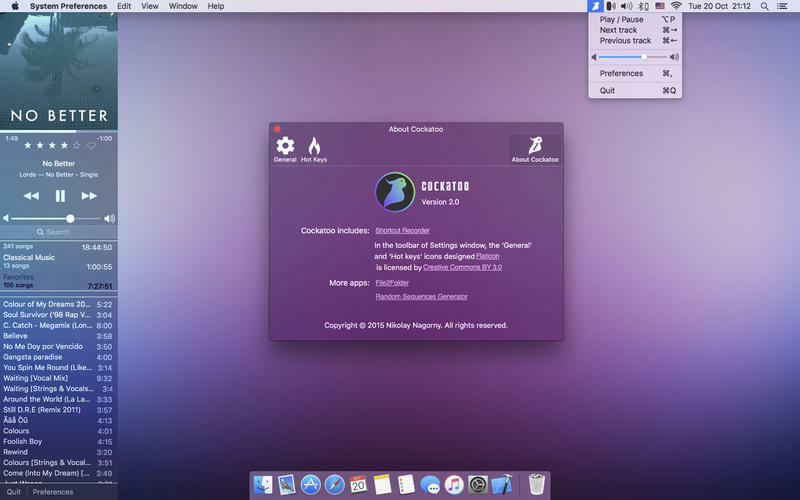 Will Cockatoo work good on macOS 10.13.4? Cockatoo is perfect if you're one of those who uses iTunes to listen to music. It provides a much simpler way of managing it, leaving you to do other things on your Mac. Sure, you can control iTunes from its interface and also from the Dock (right-click the iTunes icon), but this just isn't suitable for all users. Cockatoo quietly waits for you at the left or right border of the screen without occupying any space. You only need move your mouse to the edge to have all your music before you. Cockatoo needs a rating. Be the first to rate this app and get the discussion started! Always visible on top of other windows, allowing you to control iTunes with a single mouse-click. Automatic start iTunes when you start Cockatoo. Display information about the currently playing track. Navigating the track and volume control. Next / previous track . Select the playlist or track. Choose the location Cockatoo (right or left) . Updated interface when changing desktop wallpaper.